Since moving from the frozen wastelands of Alaska to the sandy beaches of Florida, I like to take long, leisurely jogs in the morning. Sometimes I go by myself. Sometimes my daughter joins me. Usually, Molly Muffin, my eleven-pound schnauzer-poodle mix trots along beside me. Molly is a good jogging buddy because she'll sense when I am getting tired, darts ahead, and then look back at me as if to say, "Is that all you got? Come on, you big sack of lazy bones! Get going!" This morning we power-walked to a charming coastal village two miles up the road. Molly sniffed the ground, tried to chase her tail, barked at people jogging by, and relieved herself (three times). Her head was up, her nails clicked on the paved path, and her ridiculously plumed tail waved happily with each step. She was in true, dauntless Molly form. Just before we got to Miss Lucille's Gossip Parlor, a watering hole that offers pungent coffee and tasty tidbits about locals, we veered off the path and headed to the beach. I let Molly off her leash and began my two-mile beach jog home. Usually, Molly stays by my side, but this morning she wanted to run in wild circles, like a NASCAR completing its final lap. She wanted to chase birds, dig craters in the sand, and bark at the waves. I gave up my attempt at jogging home and walked at a leisurely pace. I enjoyed the slight breeze whispering across my heated skin and the rythmic roar of the waves as they rolled over the sand. It was a red flag morning, which means high hazard, high surf, strong currents. I kept one eye on the angry emerald ocean and one eye one my fearless schnoodle. Two surfers struggled against the churning sea, barely managing to stay on their boards. They were the only ones brave enough -- or stupid enough -- to venture into the ocean. I was just about to hook Molly's leash back onto her harness when she looked up the beach, let out a shattering bark, and took off running like an Olympic athlete going for the gold. She stopped several hundred feet away, picked something up with her mouth, and tossed it into the air. Then she backed up, let out a low growl, and spun in a circle. 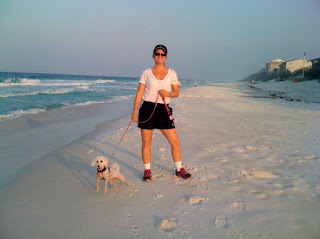 By the time I caught up to her, Molly had blazed a deep circular trail in the sand. "I want...I want...I want." I looked around, trying to figure out what it was that she wanted. 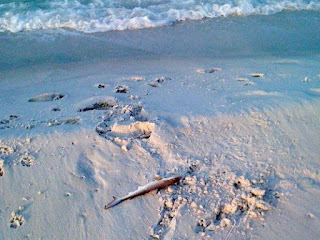 And then I saw it...a small, beached sand shark thrashing on the sand about two feet from her. Molly, my plucky, playful, fearless pup thought the wild creature was a squeaky toy and she wanted to play with it. She tried to pick it up with her mouth and toss it in the air, like she does with her rope bone and squeaky ball, but it flailed and fought, rearing back and opening its small, tooth-filled mouth in protest. Once the shark was thrashing in the waves, I released Molly. And do you know what that dauntless, determined dog did? She went charging into the waves, chasing after her new-found squeaky toy. I yelled, "Molly, come!" and she obeyed, reluctantly, petulantly, like a teenager being told to take out the trash. I hooked her leash to her harness and we headed down the beach toward home and hammy yummies and real, legitimate squeaky toys. As she happily trotted beside me, her tongue lolling out of the side of her mouth, I had to chuckle. I wish I had her ability to face difficulty with spirit and courage. She has moxie and a joie de vivre that is truly armirable. She tries to make friends with every bird and passerby, finds pleasure in the small things like walks on the beach and belly rubs, and even tries to make a shark her plaything. Ah, if only we all had Molly's moxie. Funny story. Good thing the shark didn't bite.